Autodesk has bought Tweak Software, developer of the RV image sequence viewer used at many VFX and animation studios. 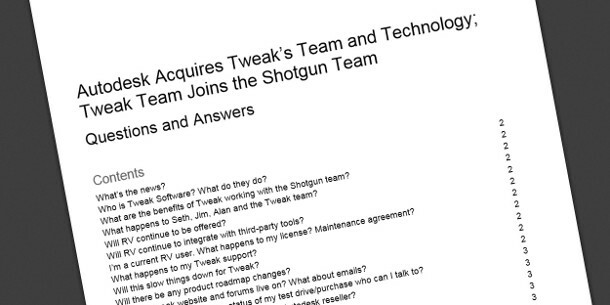 All eight of Tweak’s staff will join the Shotgun team, which Autodesk acquired last year. The buyout codifies a long-standing, but informal, partnership: many studios use Tweak and Shotgun’s tools in conjunction, and before the buyouts, the two firms had often run joint marketing efforts. Autodesk has posted a detailed FAQ document via the Shotgun Software website, but it essentially boils down to ‘no change – for now’: RV will remain an independent product, will continue to integrate with non-Autodesk tools, and existing licences and maintenance contracts remain unaffected. New licences will be issued by Autodesk – so presumably, those will be affected by the company’s decision to withdraw perpetual software licences in favour of pay-as-you-go subscriptions from next February. Autodesk also says that it ultimately expects to “integrate Tweak support … into the Shotgun online presence, along with email addresses”.